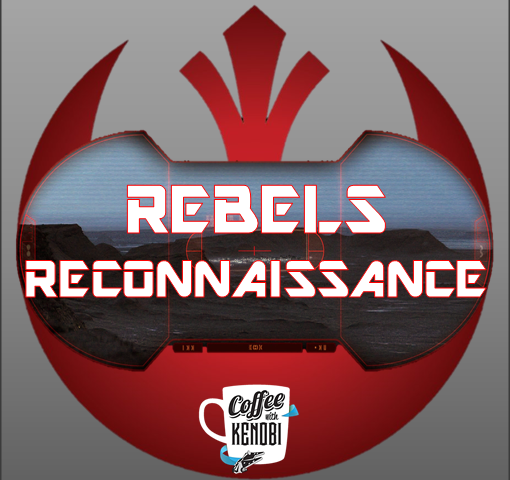 Star Wars Rebels returns this week with another pair of episodes that continue with what looks to be a season-long arc focusing on our heroes’ return to Lothal and an impending massive clash with the Empire. The first episode, “Kindred,” at first feels to be a simple continuation of last week’s “Flight of the Defender” with Ezra returning to the site of the TIE Defender crash to find the downed ship’s hyperdrive, but it soon escalates into something much more dire. Rukh, a Noghri and Grand Admiral Thrawn’s personal assassin, makes his Star Wars Rebels debut in “Kindred,” and like Thrawn before him, transitions from the “Legends” continuity to the mainstream Star Wars canon. First appearing in Timothy Zahn’s classic 1991 book Heir to the Empire, Rukh has undergone various interpretations in myriad media over the years, but his personality and physical attributes coalesce here–and the result is chilling. Voiced by Star Wars veteran and fan-favorite Warwick Davis, Rukh is simultaneously savage and cerebral, and a foe unlike any the crew of the Ghost has faced before. His appearance in “Kindred” is tantalizing brief but effective as he tracks the Rebels to their hidden camp, allowing the Imperials to nearly destroy their prey. Ultimately, we get very information about Rukh in this episode, but it seems likely that we’ll see him again for Star Wars Rebels wraps this spring. The Loth-wolves also make an appearance in “Kindred,” and the preternatural lupines reveal just a bit more about their true nature. Having previously made a connection with the Loth-wolves, Ezra finds himself willing to follow their lead into the mountains as Imperial forces arrive. Bridger and his companions decide to trust the creatures with their lives as their enemies close in, and the gambit pays off the Loth-wolves magically transport them to the other side of Lothal. It’s become abundantly clear that the Loth-wolves are inextricably connected to the Force, and the group’s arrival in a cave ostensibly covered in Jedi imagery–and the wolf’s knowledge of Kanan’s birth name Caleb Dume–suggests that the animals are also linked to the Jedi order as well. But what remains cloudy is why the Jedi were drawn to Lothal in the first place. It seems if they might have been viewed as gods when they first arrived. Did this cause them to withdraw? It seems that we’ll continue to explore the true nature of Lothal as the season progresses. “Crawler Commandeers,” the second episode of Rebels released this week, is far less spiritual and esoteric than its predecessor. Rather, it takes a more grounded approach and features a story that feels more in line with some of the show’s earliest episodes. At its core, “Crawler Commandeers” is a story about making due with what’s available and that sees our ragtag band of heroes appropriate a Mining Guild ore crawler in hopes of contacting Rebel Command. The seizure of the crawler is of course fraught with complications to add conflict, but these difficulties also allow for some great action sequences and a humorous call-back to Han Solo’s “boring conversation” during Princess Leia’s rescue from detention block AA-23, with Ezra standing in for the Correllian smuggler. The Mining Guild is closely aligned with the Empire on Lothal and is helping deplete the planet of its natural resources, so hijacking their equipment is tantamount to an attack on Imperial property. Captained by a diminutive yet cruel Trandoshan named Seevor, this particular crawler is also exploiting the people of Lothal–including Cikatro Vizago–for slave labor. The Ghost crew’s takeover of the crawler and freeing of those slaves is a victory on many fronts. Hera Syndulla is not part of this takeover, having left for Yavin 4 during the events of “Kindred” in a visually stunning escape through the Imperial blockade. Rather, the Twi’lek captain is busy advocating for a large-scale Alliance response to the Imperial occupation of Lothal. Hera’s passion regarding the need to counter the development of a full squadron of TIE Defenders with immediate action calls to mind Jyn Erso’s pleas to the leaders of the Rebellion in Rogue One, but this time they listen and agree to send reinforcements to Lothal. “Crawler Commandeers” concludes as both storylines converge. After freeing the slaves from their Trandoshan masters and disposing of Captain Seevor permanently, Sabine manages to use the crawler’s communications array to contact Hera and learns that Rebel Command has authorized an attack. Ezra responds with a mixture of relief and excitement and pledges that he and the others will be ready to coordinate a ground strike. The imminent battle for Lothal will soon be upon us and next week’s “Rebel Assault” looks to be a very compelling beginning.